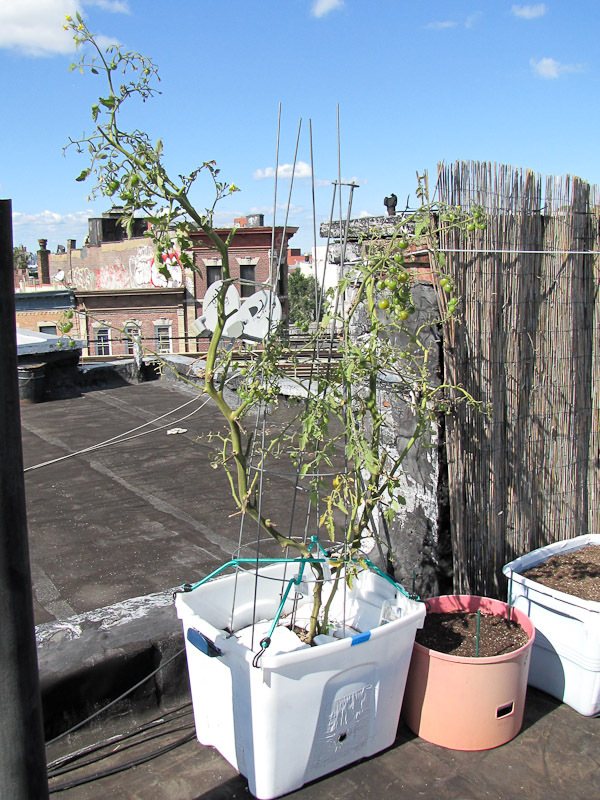 The Sun Gold cherry tomato plant is the last survivor of the summer crops and it continues to flower and fruit. Since I like the cherries so much I'm going to let the plant linger as long as the weather allows. Once the evening temps drop to the mid 50's I'll pull it out and prepare the container for winter storage. Nothing is left near the front chimney, the last Yellow Perfection tomato plant was removed last Sunday. The smaller pots have been dried out and covered with black plastic. 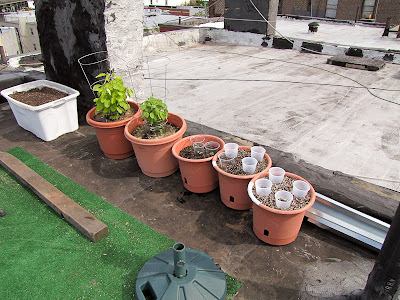 This will prevent weeds from establishing themselves while the pots sit unused. I'll do the same with the larger containers after they have more time to dry. The reed fence was tied back with nylon rope. 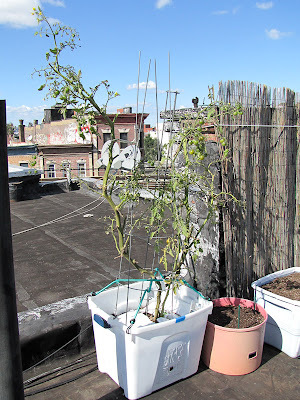 When it was supporting the combined weight of all the ripening melons I noticed the fence was pulling away from the chimney, so I decided to give it some extra support for next year. More containers waiting to dry out. The Atris peppers in the Southern Patio pot were also removed last Sunday. 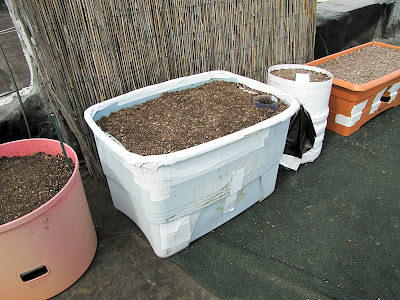 The 18 gallon light blue tote, my first DIY self watering container, has been patched up with all-weather duct tape. The plastic is quite brittle from prolonged sun exposure and every time I grab an edge to move the tote around some plastic always cracks off, so I taped the rim of the tote to prolong its life. I'm going to squeeze one more year of use out of this pot and then replace it. 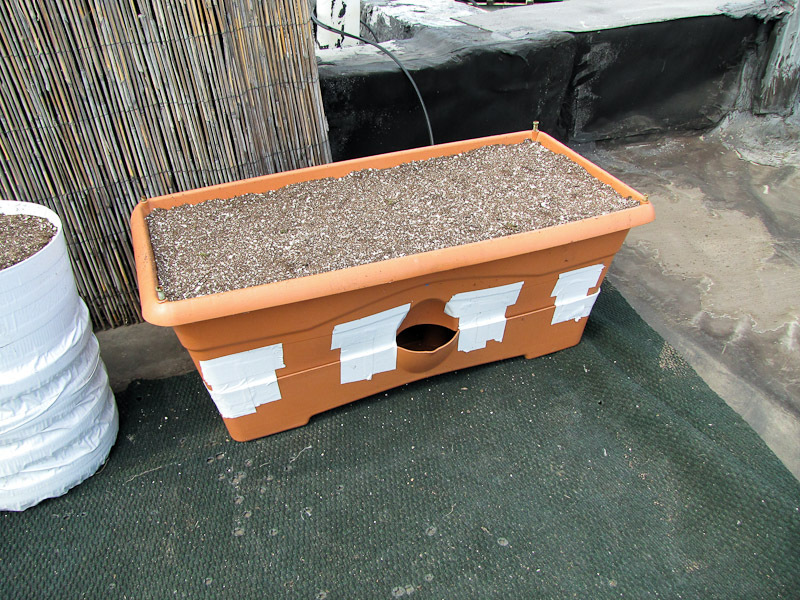 One of the Garden Patch Grow Boxes also got the tape treatment. Two corners of the water reservoir have cracked so the front side of the soil container is sinking into the reservoir. I'm not really worried about the soil container collapsing into the water. The other two corners, plus the two interior water wicking chambers also hold up the soil, it's just that the tilted growing surface annoys me, so I hope it doesn't get any worse. The fall crops are near the right rear chimney. In this location they get full sun exposure, plus whatever light the reflective roof of the adjacent building will bounce back onto the plants. In the summer I avoid putting plants in this location because it can get a little harsh (heat loving eggplants are the only exception), but in the fall the extra light boost is a help, not a hindrance. The plants are also placed touching the parapet (the wall-like barrier at the edge of the roof). 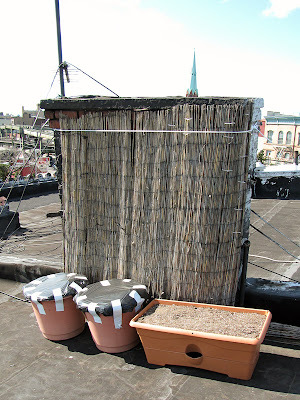 The parapet is made from concrete (or maybe bricks), so it absorbs heat during the day and releases it at night, which helps to keep the plants warm overnight. 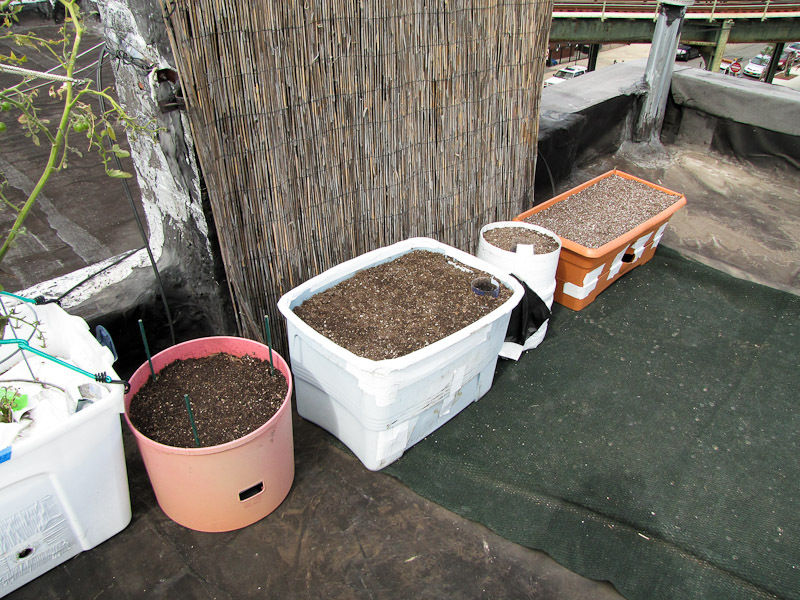 Soybeans are growing in the two larger containers on the left. Turnips are in the middle container. To the right of the turnips are some radishes. To the right of the radishes are the re-sown carrot seeds, this time with plastic collars. The last batch did not have any form of shelter. 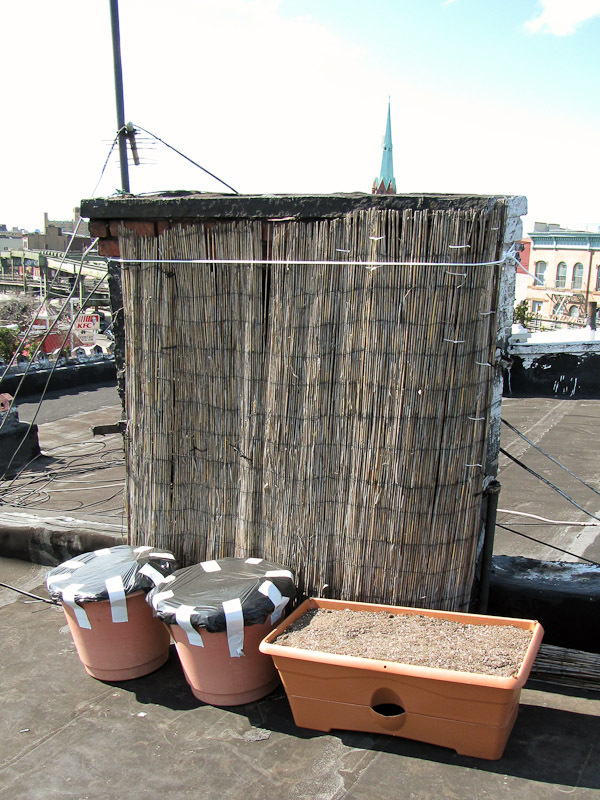 Direct sowing seeds on the rooftop clearly does not work unless you provide the seeds some kind of protection. The previous carrot seedlings were either eaten by some critter or blown away by the weather. One day they were doing fine, the next day completely gone, I wish there was a camera up here so I could see what happened to them. What have you planted for fall? My sungold plant is also still doing strong. It has been pumping out little cherry tomatoes all summer longer. So prolific and a great addition to the garden! I also still have the fairytale eggplant and lilac pepper still bearing fruit! That's great Mimi, I hope the weather stays warm for awhile. Did your orange peppers finally turn orange?